Everything You NEED To Know About VWAP! Okay guys! As promised, I have been working on tons of free useful material for the trading community, and the VWAP (Volume Weighted Average Price) is definitely the most requested indicator that I’ve been asked to talk about! If you have been trading for some time, I’m sure you have seen or heard of the VWAP – and for good reason! It’s probably one of the most popular if not THE most popular technical indicator out there, used by both retail and institutional traders alike. Let’s dive in and decode what it actually is and how traders use it in this quick and easy to follow blog post. For those of you who don’t have a PhD in mathematics (I don’t either), to simplify what all that mumbo jumbo in the formula is basically trying to tell us is if you want to calculate VWAP, you take all the prices in a specified time interval multiply it by the volume at each corresponding price in said time interval and divide all of that by the total volume up to that point in time. Still confused? Well thanks to modern technology, we have a thing called a computer that does this for us and we don’t have to be constantly doing complex mental arithmetic while trying to trade! In plain English, as the name implies, the VWAP is a dynamic technical analysis tool that traders use to measure the average price of a stock, weighted by its volume. What really makes the VWAP shine is its ability to give us information about current liquidity and the amount of money traded in a stock, which is information we would not have following price alone! Experienced traders know that volume is what moves markets and we use volume filters as a benchmark to determine healthy or unhealthy market conditions. So the VWAP measures a stock’s price with respect to its volume, giving us a better picture of where the majority of buying and selling is taking place, hence this is why you may have heard me mention in my YouTube videos or on Twitter that VWAP is a great indicator to use as an over/under in determining whether you should have a long or short bias on a stock. Okay Professor Madaz, enough with the lecture….how do we freakin’ use it to bank?! Well, just like every other indicator, there are multiple ways to implement VWAP in our trading analyses. I have created 3 simple examples for you guys below. 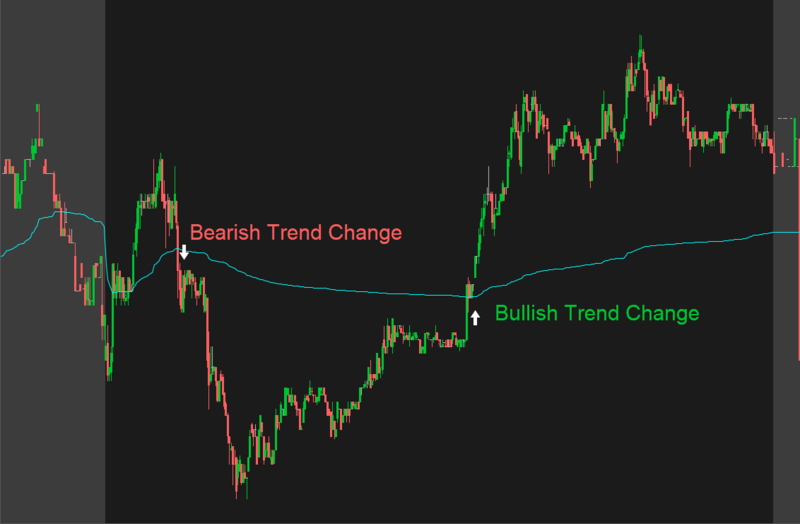 1) Bias Switch (Trend Change): This is the easiest form of analysis that traders may use to determine changes in trend, as it’s generally understood that price over the VWAP indicates that buyers are stepping in, and price falling below VWAP indicates that sellers are stepping in. I have annotated a simple example in this chart below. Note how we can use the VWAP as an over/under guide that the trend is changing for that specific time frame. VWAP used as an over/under in determining bias. 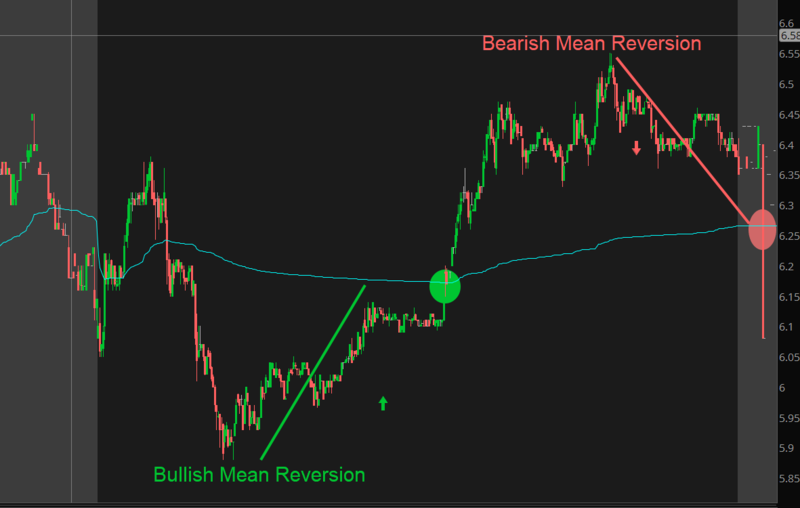 2) Mean – Reversion: A mean – reversion strategy speculates that a stock’s share price will have often have a tendency to converge to VWAP, and traders may use the VWAP along with other indicators to buy a stock in an uptrend when price falls steeply below the VWAP. In theory, this would be considered a good buy being that the price per share is far below its “true” value. In turn traders may sell a stock in a downtrend when price spikes well above the VWAP, again indicating that price is over valued, with both sides looking at the VWAP as a potential target to take profit. We can use the same stock chart that we used in the VWAP trend change as a mean – reversion chart as well, lets look at how price gradually finds its way back to VWAP after what may be considered “overextended”. A chart that deviates too far from VWAP can have a tendency to converge back towards it. 3) Mean – Reversion (Extended) : When trying to trade a reversal, we must use defined metrics to determine whether our theory is valid or not. 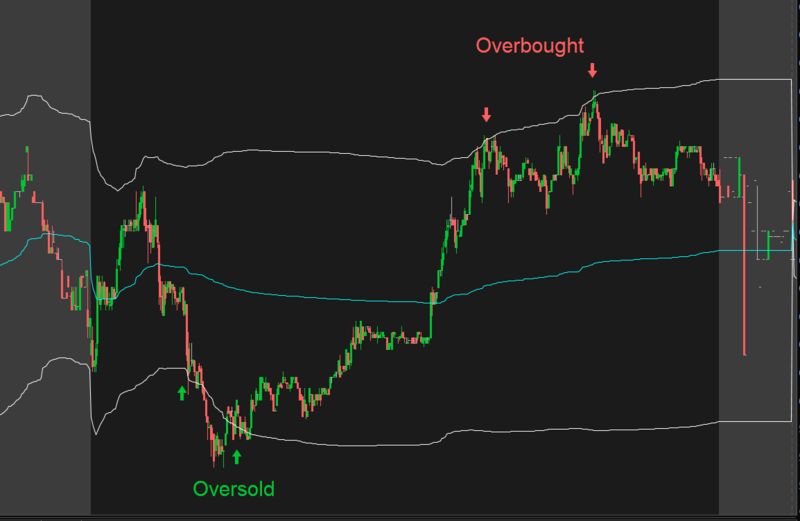 By simply adding in the upper and lower standard deviation bands on our VWAP, we have one indication on whether that price is overbought or oversold when price reaches these levels. Here is our same chart once more, but with a little MORE information! VWAP with defined standard deviation metrics to determine overextended levels to predict reversals and the aforementioned convergence back to VWAP. It’s looking a lot clearer now that we have some defined metrics to approach a trading decision, isn’t it? We can clearly see when price is moving above or below our Volume Weighted Average Price to anticipate a trend change and when the indicator tells us that price is looking over extended. Now of course, this does not always mean that its a buy or a sell at these levels, you’ll need more information for that trade like support and resistance, tape reading and even other indicators to see a fuller picture in order to make a trading decision with a high degree of confidence. However, this gives us a great idea of how to implement our VWAP on any time frame to make more-informed trade decisions and continue strong on the #NoBlowUpChallenge! I hope you enjoyed this quick blog on how I approach the VWAP in my trading! Be on the lookout for more FREE content to keep us all sharp and ready for the next move in the markets! Make sure to drop a line and let me know what the next blog topic should be!